This is a method of baking fish that comes from the island of Spetses - hence the name Spetsiotiko. It can be used for a few different types of fish. The one we prepared which you can see in the photo is Fagri or sea bream. You can also use large Lavraki or sea bass, Sinagrida or dentex, Sfirida or white grouper, large Tsipoura or dorado. As far as I have checked, these are the correct English translations of the fish names. Clean the fish and salt it. You can leave the fish whole, but if it is large you can cut it into slices. Make the sauce by mixing all the ingredients in a bowl, apart from the rusks. Place the fish in an oven dish and pour the sauce over it. Take half of the rusks and sprinkle them over the fish. Put a little of the sauce over the rusks to moisten them. Sprinkle the rest of the rusks on top. Put in a pre heated oven at 180 degrees Celsius for approx. 1 hour. 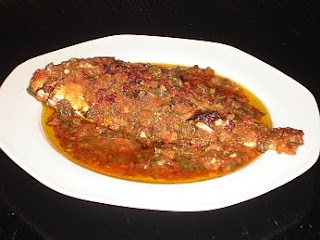 During this time, once or twice you can spoon some of the sauce in the oven dish over the fish. If, for some reason, you find that there is not enough sauce, you can add a little white wine. When it’s done, the sauce should be like a crust on the fish.